Oh those good old days! 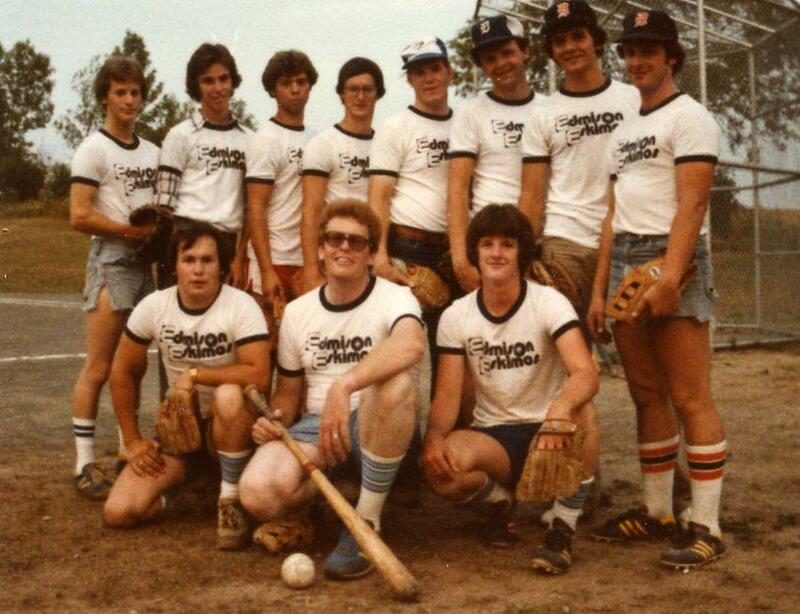 I'd look forward to Friday evenings when the Kawartha Church Slo-Pitch League would play their games. We had some great times! Then on Saturdays several of our team would play for Golfview Motors (with those terrible uniforms). Great memories. Those Edmison Eskimos became the Ambassador All-Stars with uniforms like the old Houston Astros. Navy, white, yellow and orange! I thought they looked good at the time. Wow! I just found another photo. Here's our best player, Bryan Johnson, with Mike Belsey from the rival Westmount team. 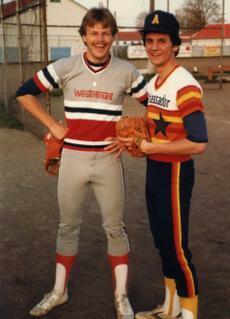 Both Mike and Bryan went on to play for the Peterborough Tigers baseball team! Me? I continued to play on Friday nights despite my advancing years! When Carol and I came back from Toronto I tried a comeback with the Calvary Cannons but my hits dribbled out to 2nd base instead of cannonading (that's a Danny Gallivan word) over the outfielders' heads. I had to hang 'em up! So sad!